Yes! It’s finally happened! The sun’s out – even here in Bolton! However, it’s not all barbecues, beaches and beer gardens (although a few of these are definitely allowed! ), it’s time to give your home its summer maintenance check. It’s not just winter that can be bad for our homes, summer can throw up a few issues too, not in the least suddenly being outside in the daylight and being able to see for yourself the ravages that winter has played. But don’t worry, there a few simple things that you can do for yourself to see whether you need to get Bolton’s Most Loved Builder 2011 and 2012 (accolades of which we are inordinately proud!) in to come a do a bit of routine summer property maintenance. In many cases a simple visual inspection of your roof will highlight any issues that have been left over from winter. Dislodged, missing or cracked roof tiles can be obvious signs that your roof is going to need further attention. However we do not recommend you then doing this yourself. Working at height is a dangerous job and should only be undertaken by trained professionals. For example between 2001 and 2010 there were nearly 10,000 claims resulting from falling from ladders, so just don’t risk it. A simple roof inspection and spot maintenance can be a relatively quick and inexpensive job and could save you from encountering further and more serious problems come winter. One of the most common issues with windows and doors is faults in the seal between the unit and the house, so keeping a regular maintenance check of your seals can be a very wise plan. Regardless of if your window and door frames are wood, aluminium or UPVC small issues in the sealant can usually be easily and cheaply rectified. 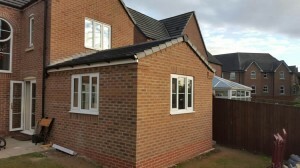 Whereas if you leave the problem to get worse it could result in complete window and door replacement come next spring. The winter of 2015 was an especially bad one, with high levels of rainfall and some cases of extreme temperatures, all of which can have an effect on the pointing between your brickwork. Damaged pointed can lead to water ingress into the interior of your house, causing serious issues with damp and mould. However again a simple visual inspection and then getting Wisecraft in to repair any areas of damaged pointing can save you serious time and money in the future. To find out more about maintaining your house for summer, contact the friendly experts at Wisecraft Ltd. Bolton today.